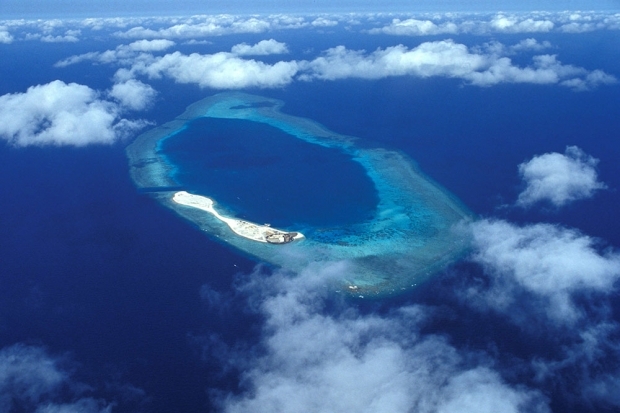 Aerial view of the Spratly Islands. As the 14th annual Asia Security Summit—or the Shangri-La Dialogue, as it has come to be known—gets underway in Singapore, we asked contributors to comment on what appears to be a recent escalation in tensions between the U.S. and China over the two countries’ presence in the South China Sea. —The Editors. The game has changed. By sending a military aircraft to take a close-up view of the outposts China is constructing and stating it “will fly, sail, and operate wherever international law allows,” the U.S. appears to have drawn a red line for Beijing. Washington demonstrated its substantive investment in freedom of navigation and open access to Asia’s maritime commons and displayed resolve to counter threats to them. The message, delivered via the navy, will discredit a calculation by some Chinese and regional actors that the U.S. is unwilling or incapable of delivering more than verbal protests, because it is distracted by crises in other parts of the world. It may also stiffen the spines of other players, most importantly the Association of South East Asia Nations (ASEAN). The U.S., however, needs to clarify its red line, bearing in mind the attendant risks. By doing so it may influence Beijing’s cost-benefit calculation about how to use the outposts it is building on remote reefs and deter China from restricting access to the high seas and international airspace. Painstaking U.S. diplomacy might also bring all claimants to agree to a moratorium on island reclamation over time. “An immediate and lasting halt” to such activities, as laid down by Secretary of Defense Ashton Carter, is a much taller order, unless Washington stands ready to impose a cost on Beijing that would risk damaging bilateral relations and regional stability. Laying down a red line but failing to enforce it would cost the U.S. credibility around the world. Washington needs to state and re-state that what it is determined to defend is the global commons, not its naval supremacy in the South China Sea. The former wins high ground in the court of international opinion. The latter may generate headlines for the grandstand wanting to see U.S.-Chinese rivalry, but will likely result in a limited alliance and set the region down a zero-sum track. To ensure region-wide cooperation, Washington has to ensure that its show of resolve provides a backbone to ASEAN, but does not replace it as the main body for the management of South China Sea disputes. Southeast Asian nations desire the security offered by a lasting U.S. presence but fear anything that would turn the South China Sea into a theatre of big-power competition. Any unilateral deterrence and enhancement to regional alliances should be accompanied by efforts to shore up ASEAN’s competence and unity. Otherwise the region’s only self-governance body risks a further loss of relevance. In attempting to prevent China from using military force to resolve island and maritime claims disputes in the South China Sea, the U.S. will increasingly face Beijing’s three-pronged trident designed precisely to preserve such a possibility. Maritime militia and Coast Guard forces will be forward deployed, possibly enveloping disputed features as part of a “Cabbage strategy” that dares the U.S. military to use force against non-military personnel. Such forces are supported by a deterrent backstop that includes China’s navy and “anti-navy” of land-based counterintervention forces, collectively deploying the world’s largest arsenal of ballistic and cruise missiles. In the region, only Vietnam also has a maritime militia, and the U.S. Coast Guard is not positioned to oppose China’s. In addition to cooperation and capacity building with regional allies and partners, therefore, the U.S. must maintain robust deterrence that paces China’s growing arsenal of counterintervention weapons. Here, unfortunately, Washington continues to suffer lingering effects from mishandling of the Iraq War and its aftermath. Among other problems, a decade of land wars with unclear, unrealistic objectives diverted attention and resources from capabilities to preserve the ability of the U.S. military to operate in maritime East Asia even while threatened by Chinese systems. Washington is finally devoting more attention to two types of weapons with particular potential to demonstrate that counterintervention won’t work—missiles and sea mines—but existing efforts may be too slow and limited to arrest an emerging gap between U.S. goals and capabilities. The following are relevant findings from a conference that the Naval War College’s China Maritime Studies Institute just held on China’s naval shipbuilding. China already deploys numerous, increasingly fast and potent missiles. The U.S. enjoys multi-mission quantitative superiority only in land attack cruise missiles (LACMs—i.e., Tomahawks). Any assumption of U.S. Navy superiority relies on next-generation long-range anti-ship cruise missiles (ASCMs) as-yet-unpurchased and -unfielded on surface combatants. These “paper missiles,” which may be difficult to target under counterintervention conditions, are the Long-Range Anti-Ship Missile (LRASM) and the Naval Strike Missile (NSM). The latter represents the extraordinary case of the U.S. looking to Norway (in partnership with Raytheon) to supply a key weapons system that American industry itself should have been able to produce on favorable terms years ago. As for surface-to-air missiles (SAMs) and ASCMs, China remains on track to enjoy quantitative parity or better. Land-based missiles with potential to threaten U.S. ships and ports they deploy from include the world’s only anti-ship ballistic missile—a tiny fraction of the world’s foremost sub-strategic ballistic missile force deployed by China. Unless this gap can be filled credibly, China is on course to “outstick” the U.S. Navy by 2020 by deploying greater quantities of missiles with greater ranges than those of the U.S. ship-based systems able to defend against them. Even maintaining mutual deterrence vis-à-vis China could be good enough for the U.S.—Washington’s key objective is to prevent the use, or threat, of force to resolve regional disputes. But allowing even the perception that such ability to “hold the ring” has eroded could gravely threaten the stability of a dynamic region that remains haunted by history. The formal speeches of the top American and Chinese officials at the Shangri La Dialogue aimed to calm everyone down over the brewing crisis in the South China Sea. Yet the informal atmosphere at the meeting remained tense, dominated by the dangerous possibility of a military confrontation. The U.S. demand for all claimants to stop new construction is unlikely to be satisfied by China. And American navy and air force are undoubtedly going to persist in conducting operations in what they consider international waters, including perhaps right up to the coastal waters of the artificial islands built on sand bars. By leaking consideration of that option, the Defense Department has signaled that it is willing to take some risks to demonstrate the credibility of its resolve to prevent China from bullying its neighbors and fortifying its claim to the entire South China Sea. The Australians are discussing joining the Americans in freedom of navigation operations in the South China Sea. The Japanese would join in too once new national security legislation is passed by the Diet. The Chinese say that their government was surprised by the strong reaction of the U.S. And countries in the region. Much of my time at Shangri La was devoted to sideline conversations with Chinese colleagues about how to avert a train wreck. We agreed that now is the time for what Secretary of State Kerry on a recent visit to Beijing called "smart diplomacy.” In past disagreements, Beijing has listened to international reactions and adjusted its position to avoid outright conflict. But will Xi Jinping, who reportedly made the decision to construct the new outposts now, behave as pragmatically as his predecessors did? In these conversations, we discussed what China could do to satisfy the concerns of the U.S. And Asian countries short of ceasing construction of the outposts? It could quietly agree not to militarize the outposts with missiles and other force protection capabilities. It could promise that it will not insist on exclusive use of the waters surrounding the outposts or challenge vessels, including military ones, navigating through them. And it could accelerate negotiations on a binding South China Sea code of conduct with ASEAN. China’s actions in the South China Sea can be interpreted as a sign of whether its intentions are truly as peaceful as it claims. If it persists in forcefully asserting its maritime sovereignty claims despite the high cost in its relations with its neighbors and the U.S., it tells us what kind of rising power we are going to have to deal with. Last weekend’s Shangri-la Dialogue (SLD) was not a “game changer” but it did clarify and intensify the dangers that lie ahead and the options confronting the United States, China and the other players. No country can afford the risks of “playing chicken” with its military. Yet Washington and Beijing are continuing to play the game. Or, to switch metaphors, the fuse leading to an explosion is burning steadily, if still slowly. Fortunately, both sides realize other options are available. Secretary Carter’s post-SLD stop in Vietnam offers a comforting illustration. He followed up his evenhanded Singapore speech—acknowledging that China is not the only regional power engaging in questionable reef reclamation—by urging the Vietnamese to cease their recent modest efforts. If Vietnam adopts the idea, it will help deflate the PRC’s unacceptable attempt to defend its massive reclamation by arguing that “everybody’s doing it.” In Singapore the PRC seemed hard-pressed to present any other justification for its worrisome transformations of reefs into military bases. A side-long glance at the currently quiet East China Sea (ECS) dispute between China and Japan reminds us that Beijing is capable of applying a softer pedal when it believes the circumstances warrant. Amid all the present rhetoric and concern that Beijing might declare an Air Defense Identification Zone (ADIZ) in the South China Sea, one might ask to what extent Beijing has sought to enforce or even remind other countries about its blunder in declaring an ECS ADIZ. One obvious option—neutral arbitration of maritime disputes, as illustrated by the Philippines’ courageous suit against China—has not yet received sufficient attention from any of the other contestants bordering on the South China Sea or most commentators, despite Assistant Secretary of State Daniel Russel’s impressive May 13 endorsement of it before the Senate Foreign Relations Committee. Few others have bothered to acknowledge the existence of the authoritative United Nations Convention on the Law of the Sea (UNCLOS) system for peacefully settling disputes of this nature to which China as well as the Philippines, Japan, Vietnam, Malaysia and other relevant countries except the United States are committed. Of course, we should ask why the Senate has failed to give its advice and consent to U.S. accession to UNCLOS, thereby denying our country the opportunity to test China’s maritime claims before an impartial tribunal. Also, more immediately, we should ask why those countries that have already adhered to UNCLOS do not follow the Philippine example by taking advantage of their UNCLOS participation to challenge China’s maritime claims before an arbitration panel of the world’s experts on the law of the sea.Bangladesh and India, for example, recently settled their long and bitter dispute over the Bay of Bengal through an arbitration award that largely vindicated the Bangladesh position but that nevertheless was gracefully accepted by Prime Minister Modi’s government as the basis for future cooperation between the two countries. The PRC has successfully pressured some of its neighbors, especially Vietnam, to abstain from the relief that is available to them under UNCLOS. Ultimately, if it loses important aspects of the Philippine suit, the PRC will find that much of the international law bluster accompanying its actions will be dissipated and it will then have to confront the world community in a much-weakened posture. I have long suggested that Vietnam and the other South China Sea claimants that feel aggrieved by China launch their own arbitration cases against the PRC rather than remain legally prudent and politically passive. Japan also, given its great interest in freedom of navigation and political stability in the SCS, should bring its own case, in particular supporting the Philippine challenge to the so-called “9-dash line.” Yet these reluctant dragons, with varying degrees of enthusiasm, understandably prefer the safer course of awaiting the decision in the Philippine case, which is due this winter. The tribunal will hold hearings next month in the Hague. To be sure, UNCLOS arbitration cannot decide the territorial sovereignty disputes concerning who owns what territory that underlie the maritime issues. That would require adjudication or arbitration by the International Court of Justice or some other independent tribunal agreed upon by the parties. But greater resort to UNCLOS arbitration would clear away important issues, promote prospects for further negotiation and constitute an encouraging precedent for using impartial tribunals to settle the territorial issues as well. The world is approaching a crisis with China. The institutions established by international law offer a significant opportunity for moderating increasing tensions. The United States and China’s neighbors need to make Beijing leaders more aware of the advantages to China as well as others of these useful means of peaceful settlement. “Bombard the Headquarters”, as they said in the Cultural Revolution, this time not with weapons but with international law petitions! The “game” in the South China Sea has been changing for several years, but it recently reached a tipping point and the U.S. government appears to have adjusted its policies in response. Prior to China’s island-building campaign and to clear indications that the PLA will militarize these new islands, the American response to rising tensions was largely to issue statements urging peaceful, non-coercive dispute resolution and respect for international law. The U.S. did not stop China’s take-over of Scarborough Shoal. It did not interfere during the HYSY 981 incident, or during China’s intimidation of the Philippines at Second Thomas Shoal, or when Chinese vessels cut the cables on Vietnamese oil and gas survey vessels. But island building and militarization in the southern part of the South China Sea affects the balance between sea power and land power in East Asia. Over the past three decades, China’s advancing missile and air power, and even its related naval capabilities, enhanced strategic stability between Asia’s traditional land power and American sea power. China felt more secure and able to defend itself and protect its core interests—perpetuation of CCP rule, territorial security, the non-independence of Taiwan, and diversifying economic interests. At the same time the U.S. position in maritime Asia was not seriously compromised and a certain strategic stability was maintained. Militarization of the newly constructed islands will change that balance. It will turn the South China Sea into a strategic strait under threat of land-based power. In times of crisis or conflict, American naval and air power will have to contest access to this important region. Fully 50% of global commerce and 90% of regional energy imports pass through the South China Sea. Militarization means that flow is much more vulnerable to Chinese disruption. The South China Sea is also a key avenue of east-west flow for American naval power between the Pacific and Indian Oceans. China’s strategic thrust to the south therefore expands the geographic area of security competition between it and the United States. Freedom of navigation is no longer the point. What is increasingly at stake is the future of America’s vital interest in regional access—economic, political, and military. Finally, and perhaps most importantly, the laws, rules, principles, and norms that brought increasing stability to the global maritime domain over the course of the 20th century are under pressure from Chinese behavior. Militarization of China’s newly built islands fatally weakens the ability of other regional claimants to maintain their positions on the surrounding Spratly Islands without outside support. Vietnam and Malaysia each possess professional militaries, but neither can match China’s advanced capabilities. China’s militarization therefore sets the clock back to a time when raw power was the basis for dispute resolution. China’s power play, combined with its refusal to arbitrate, its aversion to multilateral negotiations, and its refusal to enter into bilateral negotiations on the basis of equality, undermines regional stability and weakens important global institutions. We have a new “game” indeed.